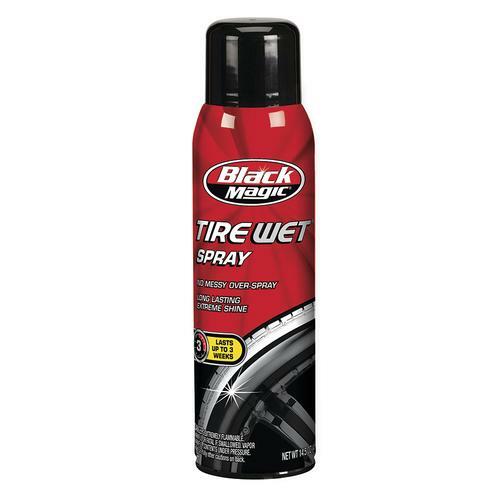 Black Magic® Tire Wet Aerosol - 14.5 oz. Black Magic® Tire Wet is specially formulated to deliver the most brilliant shine of any leading tire spray available. With one gentle mist, your tires will have the ultimate long-lasting, wet, glossy black look. The unique combination of polymers and high-molecular-weight silicones provide long-lasting, high-gloss shine that is easy to apply--simply spray and let dry, no wiping necessary. It also dries quickly so there is less chance for sling on your wheel wells. Find a store this product is available in by clicking here.